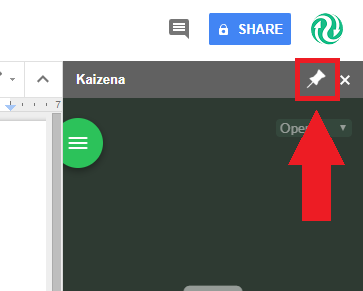 If you don't want to open Kaizena on each Google Doc you visit, you can install the Kaizena Pin extension! This Chrome extension will automatically open Kaizena on each Google Doc that you visit. That's it! From now on, Kaizena will automatically open on each Google Doc you open. To un-pin Kaizena, just click the pin icon again - this will stop Kaizena from opening automatically. Kaizena Pin is only available for Chrome.